This book is a history of the relationship between Harold John Ockenga and Billy Graham in the mid to later 1900’s. The author, Rosell, is the son of evangelist Merv Rosell. The Rosell’s were good friends and fellow ministers with both Harold Ockenga and Billy Graham. If you are interested in the history of evangelicalism and especially new evangelicalism and later fundamentalism, then you should read this book. Rosell does not shy away from presenting where Ockenga’s and Graham’s methods were challenged by conservatives. He even refers to critiques by Ernest Pickering in his book The Tragedy of Compromise; though in the end, Rosell is quite sympathetic with the entire new evangelical mandate and vision. 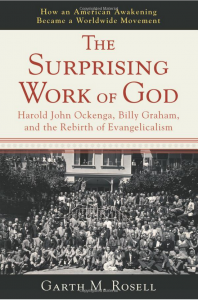 On another point, I would also disagree with the author that one can see the revival of evangelicalism through Ockenga and Graham as parallel to the Great Awakening revival of the 1730’s and 1740’s through Jonathan Edwards. The great benefit of reading this book is that Rosell has “insider” information because of his relationship with the men discussed. And so, much of their lives and their thinking is presented in a new and interesting light. Especially interesting to me was the biography of Ockenga. He was a student at Princeton when many of the professors left because of liberalism to start Westminster Theological Seminary. Also interesting was Ockenga’s journey from Methodism to Presbyterian ordination under Clarence Macartney at First Presbyterian Church in Pittsburgh.